The Gara Titan Release Adjustable is, you guessed it, an adjustable version of the Gara Titan Release binding. Adjustability in this case refers to the boot sole length (BSL), since you can slide the heel piece forward and back within a range of 28 millimeters. This will comfortably span 3 full boot sizes using a reliable bolt-positioning design. The heel piece you are moving is the new “release” model with improved elasticity when skiing unlocked. The toes are Trab’s patented design that relies on a single metal wire instead of coiled springs that are susceptible to ice build-up underneath. Factor in future-swappable heel springs that adjust forward release, and the GTRA becomes a very featureful binding for the weight. Nice work, Bormio. Heel towers have a 43° elasticity window to let you ski unlocked. 28mm of fore/aft adjustability lets you use significantly different boots. Innovative, minimalist toe piece offers locked and unlocked modes. Included removable crampon attachments accept most ski crampons. Update 2016/17: There are now three versions available with differing heel-springs: R08, R10, R12. Also the toe lever has been lengthened for easier jaw opening. Update 2018/18: This binding has been replaced with the Vario Adjustable. What material makes up the plate that mounts the heel piece to the ski and the tower that rotates to transition between tour and ski modes? Is it brittle plastic like what is used in the Dynafit Radical or strong metal that I can count on while getting rad on the way down? Hi Rob, the base and shaft are metals. There is some plastic around the outer ring of the adjustment base, but all the force is on metal. Does it exists a paper template for this binding? No shops around here does have a jig suitable for doing the mount, so a little hesitation before buying online. Hi Erik, there is a template included with each Titan binding we sell. Me being lazy....what's the final ramp delta for the binding, compared to, say, the Kreuzspitze adjustable? Glad we could help Brian! How is the ramp angle on these sweet bindings? Compared to the non-adjustable binding? 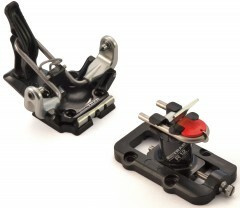 Hi Erik, the toe plate offsets the heel rise to some degree, making the delta only 4mm greater than the non-adjustable. Details here.